Looking back, we have grown a ton in the last year and we mainly have you as our loyal customers and fan base to thank. Without you guys, we would be nowhere so THANK YOU from the bottom of our hearts for letting us do what we love and at the same time provide for our families. Since our new 80P Builder website launched just over a year ago, we thought it would be interesting to show you what your favorite kits were in the last year! Continue reading this post to see our best selling kits. Which Gun Safe is Right for You? Deciding on which gun safe is right for you is not always an easy question to answer. Safely storing your firearm(s) can mean different things to different people as it is certainly not a ‘one-size fits all’ approach. Are you a last minute shopper and looking for some last minute ideas for the firearms enthusiast in your life? We’ve been there. Below are a few essential items, as well as gear that often gets overlooked. Either way, we hope to be able to spur at least a couple ideas for you. Today, there are so many models of guns, how can you possibly know which firearm is best for you? Here we take a deep dive into Glocks and four of the brands more popular models. We tell you what you need to know in order to make an educated purchase. If you’re using your firearm for self defense, hunting, for concealed carry, or for your occupation, you’ll be able to get a better idea of what you need. We discuss the features and uses of Glock 17, Glock 19, Glock 20, and Glock 27. The Glock pistol has become the leading firearm in the United States. Perhaps you’re still looking for the right firearm, or you already purchased your Glock and wondering, now what? In this article, we are going to take you through a beginner’s guide to the country’s most popular and widely used firearm. We'll discuss the history of Glocks, its parts and functions, and safety features and procedures. There are lots of reason why you should own a Glock, but we’ve tried to narrow it down to just a handful. Whether you’re a firearm enthusiast, or just someone purchasing a firearm for home protection, Glock’s can serve many purposes. Here’s a quick rundown of the top 5 in our opinion. The firing range is a great place to learn proper techniques, practice shooting targets and test out your new firearm. There are a few things you should know before you head over to the firing range for your personal safety and the safety of all those around you. So, you purchased your first firearm, but what’s next? You may ask yourself should I take a training or safety course to ensure I am confident in handling and owning a firearm? The answer in simple, YES! Owning a firearm is a very serious decision that shouldn’t be taken lightly. Announcing the New and Improved 80PercentBuilder Site! Since the beginning, we’ve been dedicated to high quality, better accuracy, and having integrity in what we do, which is why we put forth the effort to create a site that not only mirrors that mantra, but provides our customers with the highest quality web experience. We had you in mind when we redesigned our website which now includes a ton of advanced features. Our customers come first, so we built this site from the ground up to ensure that every visit to our site is the best it can be. That’s why we’re excited to annouce the launch of our brand new site, 80PercentBuilder! You want to get a new firearm or build a glock using aftermarket parts. You will have to go through gun handling training and shooting practice. You will have to teach the other members of your household safety precautions and how to safely handle guns. What else do you need to do (other than plan on taking your new gun to the shooting range)? Let’s make sure you have a proper gun-storage safety system in place before you buy your gun. Think of your gun similarly in the way you think of your car. You’re periodically keeping up with maintenance: getting oil changes, tire rotations, replacing brakes and other parts. Your gun requires the same kind of attention throughout its lifetime. Every 4000 miles or so you may need an oil change, just like every few hundred to a thousand rounds you may need to clean and replace worn parts. In this post, we’re going to lay out the basic formula for maintaining your glock so that it won’t fail you when you really need it. How fast can we spend $200? Real fast. 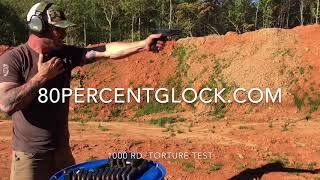 P80 1000 Rd torture test.